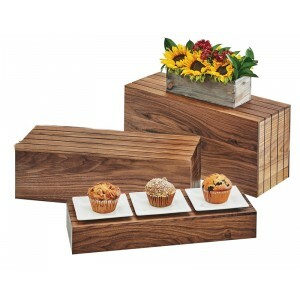 Rectangle Walnut Risers - Cal-Mil Plastic Products Inc.
Add elevation to your food presentation in style with the Rectangle Walnut Risers. This modern take on a classic item stands out among other risers with its symmetric grooves and warm walnut wood. Available in 3 heights, options are endless! Adds Elevation for a Dynamic Display!